Pizza Boy Millionaire Reviews - Legit or Scam? Pizza Boy Millionaire Reviews – Legit or Scam? Pizza Boy Millionaire, from Chris Campbell, is a work at home opportunity which claims that everyone, even people with little or no experience and little or no technical skills, can make a large income from home. 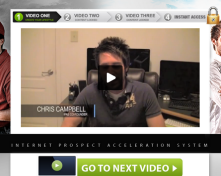 Chris Campbell claims that in his very first month of working online with this program, he made $12,000 and five months later he made over $148,000 in one month and has been able to maintain those levels ever since. The cost of joining Campbell’s business opportunity begins at $25 a month but members also have an option of purchasing packages which are priced at $500 and sometimes even more. Users should have a good idea of how much they can spend up front before purchasing. The business opportunity being sold by the Pizza Boy Millionaire is Empower Network, a multi level marketing business whose product is an at home business system. In case you aren’t familiar, multi level marketing is a type of business where representatives make money not just from selling products but also from recruiting new representatives. Empower Network is a business training system, which helps their members market their MLM sales and handle customers. Technically their tools and resources can be applied to any MLM business, even ones you already have running. But because purchasing Empower Network products automatically makes you a Network representative, many people choose to become affiliates of Empower Network and sell this business opportunity as their product. And that is what Pizza Boy Millionaire is, actually. Chris Campbell and his partner Chris Jones are members of The Prosperity Team, which is a team of Empower Network community members that offers their members extra tools and coaching to help their success. Empower Network is a well known online business opportunity which has been well documented all over the internet by both supporters and detractors. At the end of the day, Empower Network is a legitimate MLM opportunity, but their promoters often go so far out of their way to make a sale that the opportunity becomes a little misrepresented. There may be people who are earning five to six figures a month with this opportunity but they are few and far between – earning that kind of money takes lots of time, effort, and often a lot of investment capital – much more than representatives are willing to admit until after you’ve signed up. So before getting involved with an MLM, new members should be prepared for that reality.